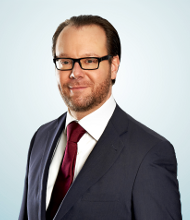 Stephan Richter is a co-founder of the firm and a licensed member of the Frankfurt/Main Bar Association. After graduating from university, he began work the U.S. law firm, Willkie Farr & Gallagher, and later for the investment banks, Lazard and Deutsche Bank. In the 5 years prior to the firm’s foundation, he practiced in a cross-border M&A boutique law firm, which was established in 2007 as a spin-off of a major U.S. law firm. In addition to being an experienced litigator, Stephan Richter has focused his practice on multijurisdictional M&A transactions as well as commercial and corporate law. He has guided foreign and domestic clients through complex cross-border deals for many years, has accumulated long-standing, hands-on experience with transactions related to renewable energy projects, and is an experienced litigation attorney. Stephan Richter is a fully qualified lawyer (Volljurist) and holds an additional master degree in Mergers & Acquisitions. In 2012, he successfully completed a training program to become a Board Certified Specialist Lawyer for Commercial and Corporate Law (Fachanwalt für Handels und Gesellschaftsrecht). Jochen Brandhoff and Caspar Behme speak out on the TUI Case. Süddeutsche Zeitung: 23. January 2017. Just one day before the opening of oral arguments at the European Court of Justice (ECJ), Detlef Esslinger of the Süddeutsche Zeitung has published an article highlighting the preliminary ruling procedure in Case 566/15, which is being led by BRANDHOF OBERMÜLLER PARTNER (“Weg da!“, SZ Nr. 18 v. 23.10.2017, S. 6 (Politik)). In the piece, our partner, Dr. Jochen Brandhoff, and Of Counsel, Dr. Caspar Behme, attorney and representative of the claimant, explain the origin and purpose of the so-called “TUI Case”. The question presented to the ECJ is whether the current German corporate co-determination legislation is incompatible with the principles of European Union law. According to the current law, the employees of German corporations working outside of Germany have no right to participate either actively or passively in the election of labor representatives to company supervisory boards. Jochen Brandhoff and Caspar Behme emphasize that their client’s intent is not to effectuate the abolishment or even the limitation of employee rights to representation in supervisory boards. Rather, with this lawsuit he is seeking to affect the Europeanization of this right to co-determination and thereby broaden its base of legitimacy. His reasoning is that any support for the principle of German co-determination must also encompass support for the inclusion of the company’s workforce abroad in these decisions. The public policy behind the right of co-determination is to ensure the wealth of experience offered by a company’s employees flows into and is reflected in the work of the supervisory board. This policy goal cannot be achieved, however, when a company employs its workforce throughout the Member States of the EU but restricts the right of co-determination to a minority of its employees — that is, giving it exclusively to those employees working within German borders. Companies will often make this restriction even when it employs the vast majority of its workforce abroad. You can read the full article printed in the Süddeutsche Zeitung here. We kindly ask members of the media and other interested parties to address their questions to our attorneys involved in the case: Of Counsel, Dr. Caspar Behme and our partners Dr. Jochen Brandhoff and Stephan A. Richter, Kaiserstraße 53, D-60329 Frankfurt, info(@)bop.legal, www.bop.legal, Tel: +49 (0)69 34 87 92 00. With its ruling on 22.11.2016, the European Court of Justice (ECJ) has referred a request for preliminary ruling in the case, C-566/15 (the “TUI-Case”), to the Grand Chamber. The Court has set the date for oral arguments to January 24th, 2017. BRANDHOFF OBERMÜLLER PARTNER represents the applicant. In this case, the ECJ must decide whether German corporate co-determination rules violate the European non-discrimination principle and the free-movement of workers by not including employees working outside of Germany in the class of persons entitled to participate in the election of supervisory boards in German corporations. “Advocado: Zalando for lawyers – the start-up providing legal services over the internet” was the headline on page 20 of Handelsblatt on 17th August 2016 (print edition no. 158). The newspaper dedicated a full-page report to advocado GmbH, which is a successful legal start-up based in Greifswald. The article describes the company’s business model, its corporate partnerships with the cooperative Volksbanken and Edeka, and the rapidly growing legal-tech market. Jochen Brandhoff is a business angel who has backed advocado and other legal start-ups; he also advises companies on the use of legal technology. With a partner, he founded Jus2click back in 1999. This was the first legal-tech start-up in Germany, and he sold it in 2003. BRANDHOFF OBERMÜLLER PARTNERS advises buyers and sellers on company acquisitions and other corporate transactions in the digital technology field. This includes the LegalTech, FinTech, InsurTech, RegTech, PropTech, MedTech, E-health and CleanTech sectors. In addition, BRANDHOFF OBERMÜLLER PARTNERS advises companies on the legal and tax aspects brought up by the digital transformation of the economy. This includes digital networking, the autonomous control of machines and production facilities, autonomous and networked driving, targeted advertising, the blockchain and blockchain applications, smart data and the world of smart services. For issues relating to legal and tax affairs in connection with the digitisation of the economy, please contact our partner Stephan A. Richter. For issues relating to legal innovation and technologies as well as the digitisation of legal advice, please contact Dr. Jochen Brandhoff, Kaiserstraße 53, D-60329 Frankfurt, info(@)bop.legal, www.bop.legal, Tel: +49 (0)69 34 87 92 00. Our Client constructed a large-scale battery system with a total capacity of five megawatts in the community of Neubrandenburg (MV). The battery’s storage capacity is five megawatt hours, in other words the grid receives power for a full hour at full capacity. This qualifies the energy storage plant to participate in the primary control market. After a 15 month test phase, the power storage plant took up routine operations. “The battery storage in Neuhardenberg marks a further step on the path to the integration of renewable energy into the system. 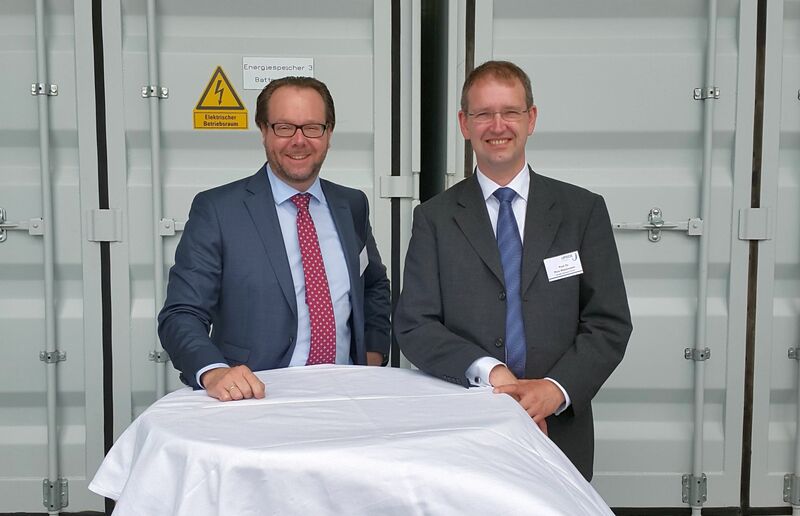 Only with consistent work on storage technologies will it be possible in the future to provide reliable and adequate power from renewable energy sources on demand” as Minister for the Economy and Energy of Brandenburg, Albrecht Gerber stated at the opening celebration on June 5, 2016. The plant is one of the largest battery storage systems in Europe. 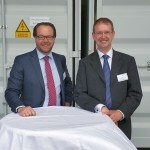 The plant consists of five identical containers housing lithium ion battery storage units. The expected useful life is 18 years. The power storage plant is located in a former airplane hangar on the premises of Germany’s largest Solarpark (145 MWp). Both electric plants are not connected to each other. The power storage units are connected to the regional distribution grid. At a cost of more than 6 million Euros, the battery storage is being subsidized with 2.85 million Euro by the Brandenburg Ministry for Economics and Europe’s power storage initiative RENplus program. The subsidy is made up of funds from the European Fund for regional development (EFRE) and state funds. If you have any questions please contact Attorney Stephan A. Richter, Kaiserstraße 53, D-60329 Frankfurt, info(@)bop.legal, www.bop.legal, Tel: +49 (0)69 34 87 92 00. Our client is a Danish investment company and an international asset manager for solar and wind power plants with a total capacity of approx. 125 MWp. With a peak performance of just shy of 40 MWp, the photovoltaic plants in Germany are the portfolio’s main focus. Brandhoff Obermüller Partner has been engaged to optimize all legal aspects of our client’s power plant business in Germany. The legal optimization encompasses the review of out-of-court and in-court enforcement of defective performance and warranty claims arising from EPC agreements. The most contentious issue is an energy yield assessment prepared by the general contractor that materially influenced the purchase price amount. Brandhoff Obermüller Partner also reviews maintenance and plant management agreements for ineffective provisions. The focus of the review is to identify ineffective agreement terms (duration), liability limitations and other unreasonable or unusual clauses. If you have any questions please contact Attorney Stephan A. Richter or Attorney Dr. Jochen Brandhoff, Kaiserstraße 53, D-60329 Frankfurt, info(@)bop.legal, www.bop.legal, Tel: +49 (0)69 34 87 92 00. BRANDHOFF OBERMÜLLER PARTNER and Wirtschafts-Assekuranz (WIASS) have developed a new standard process for the enforcement of claims in the logistics sector. The process provides logistics companies and fleet operators an efficient claims management solution. The advantages lie in quicker and more cost-effective claims processing, more resource efficient fleet management, higher claims settlement proceeds and more efficient cost control. WIASS and BOP have successfully applied this new innovative process to numerous liability cases. Process and legal workflow management standardization reduces legal costs and increases process efficiency. This is particularly true of recurring standard insurance claims and standard legal services, such as claims settlement in the logistics and insurance sectors and in the case of complex mandates, such as M&A transactions and restructuring. Harald Brand, the managing director of Wirtschafts-Assekuranz-Makler GmbH, one of Germany’s largest insurance brokers, adds: “This process analysis often determines that an attorney may not be the most efficient choice for the task at hand, another specialist may be the more efficient choice. For this reason, interdisciplinary collaboration gains in importance when compared to more traditional practice-area focused legal services”. If you have any questions pertaining to claims management please contact Attorney Stephan A. Richter, Partner. If you have any questions pertaining to Legal Process Management (LPM) and other process management solutions for legal departments and law firms please contract Dr. Jochen Brandhoff, Partner. Access our Press Release here. On January 16, 2016, the European Union and the United States of America lifted economic and financial sanctions against Iran. On that date, on the so-called Implementation Day, as defined in the Vienna Agreement, comprehensive sanction relief for the benefit of the Islamic Republic of Iran went into effect. This opened the door to the restart of the commerce and trade relationship between Europe and Iran. Our client develops, plans and builds solar power plants and is one of the leading photovoltaic system providers in Germany. With the opening up of this new market, our client would like to take advantage of the opportunities associated with the improvement in commerce and trade and to that effect is in the process of planning its entrance into the Iranian market. BRANDHOFF OBERMÜLLER PARTNER will provide the client with advice and counsel on all legal issues associated with the expansion into the Iranian market. These also include compliance with EU and US sanctions that are still in effect, Anti Money Laundering and Terrorist Financing regulations and other associated punishable offences, as well as meeting Export-Compliance-Regulations and other regulatory obligations. In this process, the influence that the planned expansion into the Iranian market may have, particularly possible detrimental effects on our client’s US business, its parent company and other group companies, must be taken into consideration. The firm is also providing advice to the client on the conclusion of a cooperation agreement for the development of Photovoltaic projects with a project developer. Our client will construct the photovoltaic plants and conclude Power Purchase Agreements with Iranian companies and institutions, such as the Renewable Energy Organization of Iran (SUNA) and the Iran Power Generation and Transmission Company (TAVANIR). If you have any questions pertaining to commerce and trade relationships with Iran please contact Attorney Stephan A. Richter, Attorney Ali Fazli or Attorney Dr. Jochen Brandhoff, Kaiserstraße 53, D-60329 Frankfurt, info(@)bop.legal, www.bop.legal, Tel: +49 (0)69 34 87 92 00. In the first quarter of 2016, BRANDHOFF OBERMÜLLER PARTNER advised an investor on his participation as a business angel in three of the leading German legal business start-ups. All three legal-tech startups successfully completed their first second-stage financings. They had already received seed financing in 2014 and 2015. Two of the legal-tech companies offer internet platforms which bring together buyers of legal services with a database of specialist lawyers. Algorithms evaluate the information regarding lawyers’ specialisations and then come up with the optimal match of demand and supply of legal services. One of the two legal marketplaces also provides standardised legal products at a fixed price. The third company is in the field of automated application of the law. The software was developed in-house and addresses legal issues in certain areas of the law, without a lawyer. BRANDHOFF OBERMÜLLER PARTNER advised the angel investor on the participation agreement and the capital increase. Having already advised a financial investor on his private equity participation in a FinTech business, the firm is continuing to build on its expertise in the field of digital technologies, in particular in the areas of financial technology, regulatory technology, compliance technology, and legal technology. Using their specialist knowledge, BRANDHOFF OBERMÜLLER PARTNER offers practical value added in M&A transactions and the legal and tax aspects surrounding the digitisation of the economy (robotics, automation, 3D printing, intelligent data analysis, block chain, smart data, smart service world, IT-aided optimisation of business processes and product standardisation). The firm’s legal and tax partners are Dr. Jochen Brandhoff, Stephan A. Richter and Prof. Dr. Falko Tappen, Kaiserstraße 53, D-60329 Frankfurt, info(@)bop.legal, www.bop.legal, Tel: +49 (0)69 34 87 92 00. Our client develops and constructs large-scale photovoltaic power plants in key European markets. For the construction of a 10 MWp photovoltaic power plant in the south of Scotland, our client is acquiring a special purpose vehicle that is in possession of the required grid connection, construction and operation permits and licenses. Brandhoff & Partner is responsible for the legal and tax side of the company acquisition and the realization of the PV power plant. This also includes preparing a due diligence report for the project, drafting agreements for the special purpose vehicle acquisition, for the supply of modules and inverters, as well as for the connection of the solar plant to the grid. Brandhoff & Partner has been selected for the second time in a row as one of the German leading law firms to be listed in the new issue of the legal guide “Kanzleien in Deutschland 2014” (Law Firms in Germany 2014), an annual publication of the renowned German Verlags publishing house Nomos (part of the Verlagsgruppe C.H. Beck) The editorial office of the publishing house, consisting of 25 people, selects around 400 leading practices out of 10.000 commercial law firms. The presentation of Brandhoff & Partner on pages 132 and 133 emphasizes the corporate background/industry experience of the lawyers working for the firm. „Thanks to their industry experiences (the firm) is able to assist high-volume joint ventures”. Particular sensitivity to international character of the affairs contributes to the quality of the law firm of (almost) medium size. “Consulting services provided by the firm reach Europe, Africa, Asia and South America“. Many new lawyers have started to work for the firm. As a result, the key area of the firm’s activity will increasingly expand throughout cross-sector legal advice to SMEs: As the editor reports, an increase of clients from companies and family offices outside the renewable energy sector has taken place.